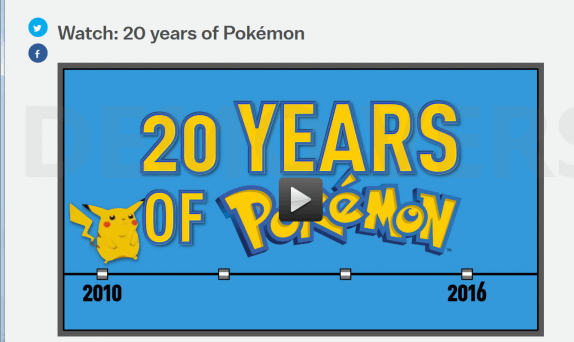 Nothing takes the starch out of history like a short, informative, funny video, e.g., “20 Years of Pokémon” (viewable here). In a mere 2:26 it visually answers the core question “How did a small Game Boy game become an international icon?” I chuckled aloud as images of Bill Clinton, the 2011 Royal Wedding, and bits of the Nintendo archive flashed by. Thanks to Vox.com for this exemplary timeline-slash-backstory.